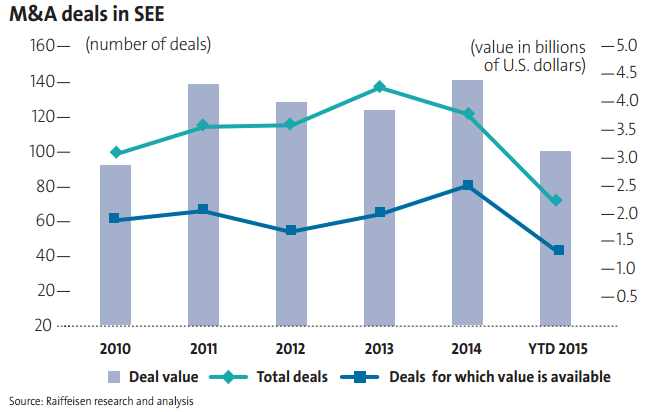 2014 was a limited success year for mergers and acquisitions (M&A) in Southeast Europe (SEE), but an analysis of deals already announced in 2015 indicates an improving outlook. In the past couple of years, the M&A activity in most SEE countries suffered to differing degrees from slower economic growth, the small size of the national consumer markets and political instability. 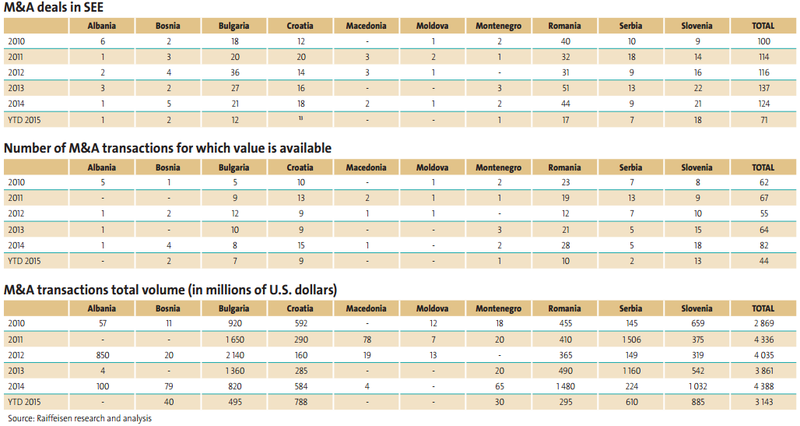 Nevertheless, local specifics rather than common features tended to determine the main drivers of M&A in each country. Romania stands out as the undisputed M&A leader in the region based on sound economic performance and sector maturity which enable it to attract more interest from international investors. Following a year of instability, Bulgaria firmly returns on the radar of both strategic and financial foreign players. Intra-SEE M&A carried out by local and regional players increased in significance and was a factor especially in the Western Balkans. With around 7 billion euro allocated for investments in the Central and Southeast Europe (CSEE) by private equity firms, the region is set to benefit from increasing fund raising. 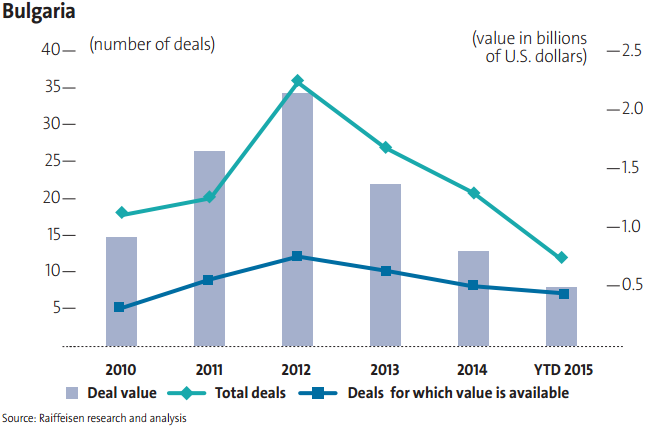 Despite the healthy level of M&A activity, there was a decline in deals in Bulgaria in 2014 compared to 2012 and 2013. 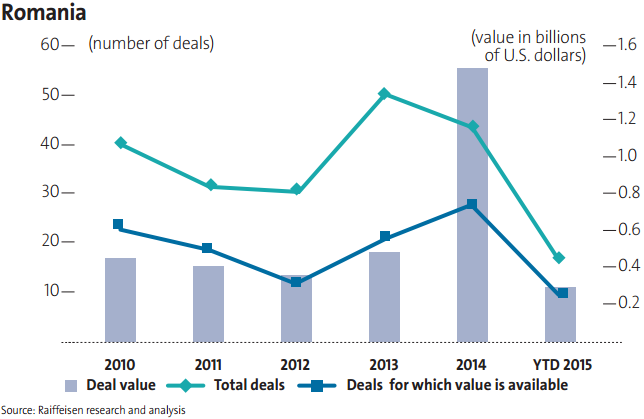 The total value of M&A has been generally limited in the past several years except for single deals accounting for most of the value in each year. The inferior performance in 2014 could at least partly be attributed to the political uncertainty as early general elections were held in two consecutive years, as well as to the undermined confidence in the country’s financial and banking system following the close-down of Corporate Commercial Bank (Corpbank). These factors exacerbated the effects of slow economic recovery and unreformed sectors of the economy, such as energy, causing structural tension. The list of major M&A deals in Bulgaria prior to 2015 included the 290 million euro acquisition of cigarette producer Bulgartabac by Livero Establishments (in 2014), the sale by Rohatyn of a minority stake sale in Huvepharma for 255 million euro (in 2014), the 207 million euro acquisition of software developer Telerik by Progress Software Corporation (in 2014), the sale of Credit Agricole Bulgaria to Corpbank (in 2014), Austrian Post’s acquisition of M&BM Express (in 2014), the deal under which Euroins Insurance Group bought the Bulgarian operations of Germany’s Talanx International (in 2014), and the acquisition of 20.3% in Neochim by Austrian chemicals group Borealis and Bahrain based First Energy Bank (in 2014). A key M&A trend in in Bulgaria over the past several years has been the exit of international strategic investors, as their place has been taken up by local players. Examples here include food retailer Delhaize, do-it-yourself (DIY) retailers bauMax and Praktiker, Bayerische Landesbank, hotels Kempinski and Hilton in Sofia, metal trader Kloeckner, media group Sanoma, and renewable energy companies Bosch and Verbund. In addition to successful disposals, a number of desired exits did not take place due to a wide valuation gap or lack of sufficient buy-side interest. The electricity sector for one, the renewable energy sector in particular, was very affected as political pressure resulted in attempted regulatory changes aiming to revoke preferential terms and hence sharply increased the perception of regulatory risk. These events triggered significant M&A activity on the secondary market towards desired exits but only a few deals – Kelag’s buy out from Raiffeisen Energy and LukErg Renew’s purchase of Vesta’s wind assets – were wrapped up. Notwithstanding Bulgaria’s unsatisfactory M&A performance in the preceding couple of years, 2015 seems to bring a renewal of deal activity. Several large deals have been announced since the beginning of the year: the 195 million euro acquisition of tiles producer KAI Group by U.S.- based Mohawk Industries, the 140 million euro acquisition of fixed telecom services provider Blizoo by Telekom Austria’s local subsidiary Mobiltel, and the acquisition of 50% of poultry producer Ameta by German Paul Wesjohann&Co. Furthermore, a growing list of small deals speak of renewed interest on the part of international strategic players in various industrial and consumer-oriented production and trade segments, along with increased activity among local players. Another encouraging sign is that the scope of industries traditionally driving M&A in Bulgaria, such as financial services, telecommunications and consumer goods, is increasing. New sectors gaining pace for M&A activity are in the first place technology, followed by healthcare and agriculture. Technology, particularly IT and business process outsourcing, has grown exceptionally well in Bulgaria during the past several years and has attracted significant levels of greenfield investment from many international players. 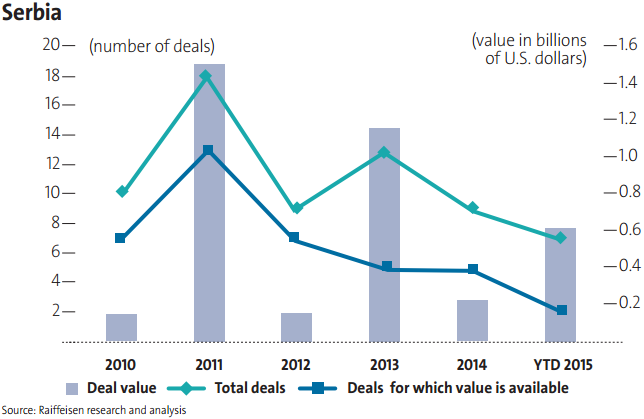 Now the sector seems to have reached the point at which it also becomes a driver for M&A. The IT subsegment already generated the largest deal in Bulgaria for 2014, the above-mentioned 207 million euro deal for Telerik, and recently saw a second large deal in less than one year – the acquisition of the software developer Fadata by a consortium between Riverside and the U.K.- based Charles Taylor. At the same time, significant deals took place even earlier in the business process outsourcing subsegment, namely the acquisition of CallPoint New Europe by Telus International in 2012 and of Sofica Group by TeleTech at the beginning of 2014. Activity in the technology sector continues with the recently announced acquisition of local digital marketing agency Ilyan.com by Opera Group, the acquisition of U.K.- based e-commerce platform eCommera with significant operations in Bulgaria by marketing and communications group Dentsu Aegis Network in June 2015, the acquisition of TelecityGroup Sofia by U.S.- based Equinox in June 2015, the acquisition of web portal Dir.bg by local Logo-Company in December 2014, and the acquisition of 50% of price comparison website kabelna.com by French Selectra, also in December 2014. The large number of small to mid-size independent players populating a diversified range of niches in the technology sector in Bulgaria on the one hand, and the continuing strong growth of the sector and interest in it from international players on the other, give grounds for confidence that it will increasingly be a significant factor for M&A in Bulgaria going forward. Another new member of the Bulgarian M&A club is healthcare where 2015 is seeing the beginning of consolidation by local players. In the patient care subsegment, acquisitions of Burgasmed hospital and clinic by the group affiliated to Sofiamed hospital and of Cardio Center Pontica by City Hospitals and Clinics Group were both announced in May 2015. In the pharmaceutical subsegment, local generics leader Sopharma group acquired control through the stock exchange of producers Rosa-Sevtopolis (2014) and Medica (May 2015) and is rumoured to be seeking acquisitions in pharmaceutical retail. The owner of another large local player, veterinary pharmaceuticals producer Huvepharma, bought back the stake held by its financial partner in 2014 while the company itself has been active as acquirer abroad. Given the present fragmentation in the segment, these few deals could be just the onset of a series of M&As. M&A activity in the agricultural segment increased in the past couple of years due to landstock accumulation. It is driven by the anticipated appreciation of agricultural land as a result of the EU-sponsored growth of Bulgarian agriculture and farming. The activity is dominated by local players. At the same time, there have been no significant M&As involving farming enterprises. Except for wheat growing, agricultural producers in Bulgaria are still extremely fragmented indicating potential for M&As in the future. Further to the sectors discussed above, expected drivers of M&A activity in the short term include the disintegration of the business groups affiliated to Corpbank, the restructuring of Greek banks, and to some extent privatisation. It is expected that the Bulgarian operations of Greeks banks will be sold as part of the restructuring of their parents. The first step in this process is the announced merger of Alpha Bank in Bulgaria into Postbank, Eurobank EFG’s Bulgarian subsidiary. At the same time, the government has indicated intention to privatise certain state-owned assets, including freight railway transport company BDZ Cargo, following restructuring, the Bulgarian Stock Exchange and the Central Depository, and some 30 smaller enterprises. These public sector opportunities are complemented by certain pending concessions. It should be noted, however, that attracting investor interest for many of the enterprises on the sale list may prove a challenge given their current performance or, in some cases, the chosen privatisation method. Recent developments on the Bulgarian M&A market seem to indicate two general trends: a cautious return of international investors, and an increasing significance of local players. Despite the slow economic growth in the past several years, certain sectors of the economy have done well and investors are already appreciating it. The acceleration of GDP growth in 2015 could be expected to have a further positive impact on the M&A activity, although the small scale of the Bulgarian market limits the attractiveness of local business. M&A activity in Croatia declined in 2012-2014 but there are indications of recovery in 2015 as the number of deals announced in the first seven months of the year approaches the total number for each of the previous three years. M&As in the country are primarily driven by the private sector, with local investors playing a significant role. Key sectors driving private sector M&A are traditionally tourism and hospitality, food and consumer goods, and financial services. The list of recent deals includes several acquisitions of tourism and hotel operators, including Istraturist Umag, Adriatica.net and Hilton Imperial Hotel, mainly by local players, as well as the acquisition of cement producer Cemex’s operations in Croatia (with assets also in Bosnia, Montenegro and Serbia) by the Hungarian subsidiary of Heidelberg Cement Duna-Drava Cement, the acquisition of pharmaceutical producer Genera by Dechra Pharmaceuticals, the acquisition of UniCredit Leasing Croatia and Locat Croatia by Zagrebacka banka, and, notably, the 550 million euro acquisition by British-American Tobacco of TDR, and its vertically aligned affiliates along with retail chains iNovine and Opresa, from Adris Grupa. Local players have a significant impact on the M&A market in CrGoing forwardoatia, in particular the diversified business groups Agrokor and Adris Grupa which are active as both buyers and sellers. Although the government enacted legislative changes in 2013 to facilitate privatisation, so far it has had limited success. The attempted privatizations of Hrvatska Postanska Banka, Croatia Airlines, rail freight carrier HZ Cargo, shipping company Jadroplov and certain state owned hotels and resorts failed to attract investor interest due to their financial condition and the aggressive terms sought by the Croatian government, while the outcome of the sale process for fertiliser producer Petrokemija is still uncertain. Furthermore, no progress was made in relation to the announced privatisation of a number of other companies including sea and river ports and Hrvatska Lutrija. Recent successful deals include the privatisation of insurer Croatia Osiguranje and the concession deal for the Zagreb Airport. The planned IPO of 25% interest in the national electricity company Hrvatska elektroprivreda (HEP) too is expected to attract significant interest. State-owned equity in food producer Podravka, electrical equipment producer Koncar, marina operator Adriatic Croatia International Club (ACI) and postal carrier Hrvatska Posta could raise significant interest among international investors but are not included in the government’s privatisation plans for the foresee-able future. Going forward, it could be expected that the emerging M&A growth observed so far in 2015 will be supported by the resumed GDP growth after the economy reached a turning point in 2014. Croatia’s accession to the EU in the middle of 2013 will also have a positive impact by increasing investor confidence and providing access to EU funding, expected to benefit in particular sectors such as construction. The ongoing consolidation and privatisation in the tourism and hospitality sector are another driver of M&A activity. At the same time, privatisation in other sectors does not seem likely to play a significant role for M&As in the near term. Romania is by far the leader in M&A activity in SEE, accounting for more than one third of the number of deals in the region. 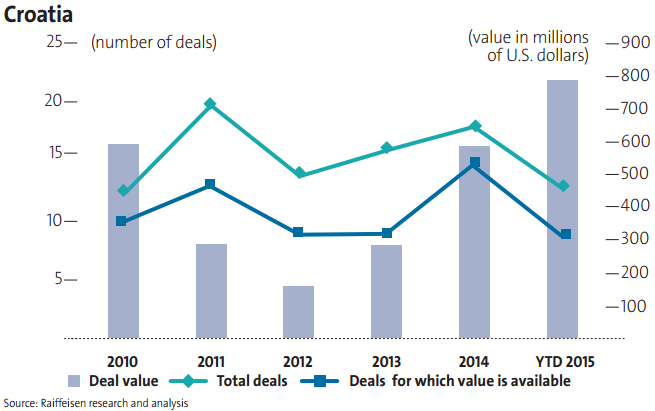 M&A levels in 2013 and 2014 marked a significant increase compared to the preceding years. M&As are taking place in many sectors of the economy – financial services, real estate, transportation and consumer goods being among the main drivers. IT and agriculture too saw some landmark deals indicating the potential of these segments for the future. Deals in the banking and insurance sectors represent the major part of recent M&A activity, including the acquisition of Volksbank Romania by Banca Transilvania (in 2014), the acquisition of Millenium Bank Romania by OTP Bank Romania (in 2014), the acquisition of both the retail and the corporate business divisions of RBS by UniCredit Tiriac Bank (in 2013-2014), the acquisition of the retail division of Citibank Romania by Raiffeisen Bank (in 2013), the acquisition of MKB Nextebank by Axxess Capital (in 2013), and the acquisition of EURECO’s life and pension operations by Aegon (in 2013). Furthermore, according to public announcements, deals involving Banca Carpatica and Cyprus Popular Bank owned Marfin Bank are expected to take place shortly. The sector is likely to continue to generate M&As, driven by disposals of the local operations of, on the one hand, Greek banks in the context of the upcoming restructuring of the Greek banking system, and on the other, certain international banks such as Credit Agricole and Intesa Saopaolo as part of their strategy to exit markets where they have been unable to achieve a certain scale. However, deals involving Greek banks may be delayed by reorganisation and mergers that need to take place beforehand. Another sector which accounted for a significant part of the recent M&A activity is transportation and related services, with the acquisition of United Shipping Agency by Chinese-owned Nidera in 2014, and the acquisition of North Star Shipping and Minmetal by U.S.- based Archer Daniels Midland Company (ADM) announced in May 2015. The sector is likely to attract further deals; intermodal transport in particular has been named as one of the areas of interest of Chinese investors, and infrastructure is one of the priorities of the Chinese CEE Investment Corporation which has set aside $500 million for investment in 16 countries in Central and Eastern Europe including Romania in the next two-three years and is in the process of increasing the committed funds. The real estate sector saw two of the largest recent deals in Romania: the 148 million euro acquisition of Floreasca City Center, owner of Promenada Mall in Bucharest, by New Europe Property Investments (NEPI), and the 95 million euro acquisition of a 35% interest in hotel operator Societatea Companiilor Hoteliere Grand by Strabag, both in 2014. M&As in the sector continue in 2015, dominated by several investors, the most important being the South-African investment fund NEPI, Globalworth controlled by Greek businessman Ioannis Papalekas, Cyprus-registered Secure Property Investment & Development (CPDI), and Czech real estate developer CTP. Recent transactions represent consolidation in the sector by these players challenging the position of the incumbent main players CA Immo and Immofinanz. The ongoing disposal by banks of large portfolios of non-performing loans, many of which used to finance real estate projects, is a factor further supporting M&As in real estate as it brings opportunities for bargain deals in the sector. A major anticipated deal is Immofinanz’s intended sale of European logistics sites three of which are located in Romania. Other recent big deals in Romania include the 100 million euro acquisition of the second largest medical services operator in Romania, Regina Maria, by Mid Europa Partners in August 2015, the acquisition of suppliers of goods and services for agriculture Comfert and Redoxim by Irish Origin Enterpises in July 2015, the acquisition of tissue paper producer Pehart Tec by Abris Capital Partners in May 2015, the acquisition of mineral water bottler Rio Bucovina by Polish soft drinks company Maspex Wadovice in August 2015, the acquisition of 42 service stations by MOL from ENI in February 2015, the acquisition of gas distribution company Congaz by GDF Suez Energy Romania in 2014, the acquisition of the Romanian operations of DIY chain bauMax by Leroy Merlin in 2014, and the acquisition of metal products manufacturer Cromsteel Industries by ASO Siderurgica in 2014. In addition, a number of smaller deals were annunced in various sectors involving both international and local acquirers. Private equity firms retain their interest in Romania, with Mid Europa Partners, Carlyle Group, Montagu, PPF Investments, Abris Capital and Axxess Capital making new investments in the country in the past few years. In addition to the mature economic sectors which account for the major part of M&As in Romania, new sectors with the potential to generate M&A growth are emerging. One such sector is technology. A high profile, large ticket deal which took place in 2014 was the $500 million acquisition by Facebook of monetization platform LiveRail, a company co-founded by two Romanian and one British individuals and having a development office in the town of Cluj-Napoca in Romania. The deal signifies the success of the technology sector in the country in general – one of the fastest growing sectors as the country is now considered among the most attractive global destinations for IT and business process outsourcing. Although greenfield investment by large international players tends to be the preferred method of tapping the favour-able conditions for technology business in Romania, several local software developers and e-commerce companies have reached a scale that could attract the interest of international investors. Such companies include Bitdefender, Siveco, TotalSoft, Gersim, Mobile Distribution, F64 Studio and PC Garage. Another sector which holds promise for M&A growth in the future is agriculture. The sector has become increasingly attractive due to low costs and good quality of agricultural land. Large international players have already entered land ownership and farming in Romania, including financial giants Assicurazioni Generali and Rabobank, German investment funds Germanagrar and Agrarius, Danish Ingelby and FirstFarms, Dutch DN Agrar, and Lebanese Maria Group. The investment fund Insights Investments through its vehicle Alisa Farming, the investment fund Spearhead International, as well as the multinational group Martifer, are in the top 10 of landowners in Romania with landstock of 14,000 to 25,000 ha. Nevertheless, there are also large local agricultural players such as Interagro, Grup Racova, Comcereal Dolj and Agricost. Furthermore, although it is still dominated by small and medium players, the animal farming subsegment of the agricultural sector already has some local players of its own which have reached an attractive size, including Transavia, Agricola and Kosarom. 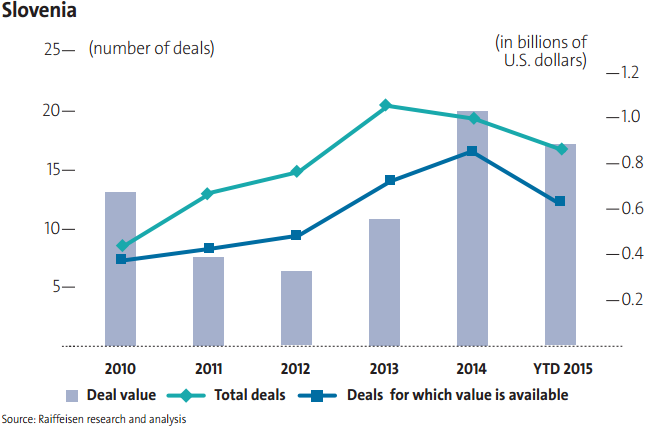 Apparently there are both interest and room for further consolidation in the sector which set the stage for future M&A. Privatisation will not be a significant contributor to M&A activity in Romania in the near future. Excluding the privatisation of minority interests through the stock exchange, the main pending privatisations are limited to the sale of postal operator Posta Romania where a deal is being negotiated with the single bidder, Belgian Bpost, and that of the national freight railway transport company CFR Marfa, for which the government decided to change the strategy to listing on the stock exchange in 2016 after a failed deal with Grup Feroviar Roman in 2013. Except for chemical producer Oltchim which will potentially be up for sale in three years after carrying out a restructuring plan, at present there are no other significant privatisation targets. The excellent economic performance of Romania in the recent years, with real GDP growth of around 3% in each of 2013 and 2014 and expectations for around 4% GDP growth in 2015, and the larger scale of its market compared to the relatively fragmented markets of its neighbours, seem to make it a good place for M&A in the foreseeable future. Sustained interest on the part of financial sponsors conveys confidence that doing business in the country can generate good returns for investors. The strength of Romania’s M&A market is underpinned by the fact that deals are generated by many sectors across the economy, with new sectors emerging as further M&A drivers. Non-reliance on privatisation which is an unsustainable and problem-ridden source of M&A renders a further advantage. Overall, there are sound reasons to expect that Romania will continue to be the M&A leader in SEE in the short to medium term. M&A activity in Serbia was at relatively low levels during the past five years compared to its neighbours, except for certain large deals which dominated the M&A landscape – the 575 million euro acquisition of Danube Foods Group by Mid Europa Partners in February 2015, the 1 billion euro acquisition of Serbia Broadband by KKR from Mid Europa Partners in 2013, and the 950 million euro acquisition of retailer Delta Maxi by Delhaize Group in 2011. In addition to these landmark deals in the food and beverage and telecommunication sectors, smaller deals, including certain add-on acquisitions by Serbia Broadband, took place. Another sector which contributed to M&A activity in the country was financial services, with acquisition of the Serbian operations of Italian Findomestic Banka by OTP (in 2015), the acquisition of the SEE network of Hypo Group Alpe Adria by Advent International and the European Bank for Reconstruction and Development (EBRD) (in 2015), the acquisition of minority interests in insurance group Delta Generali Osiguranje by Generali (in 2014), the acquisition of AIK Banka by local MK Group (in 2014), and the acquisition of KBC Banka by Telenor (in 2013). Privatisation has so far had little impact on M&A activity in Serbia. The list of successful recent privatisations is limited to the sale of Cacanska Banka to Turkey’s Halkbank in January 2015, the sale of 49% of the shares in flag carrier JAT Airways to UAE-based Etihad Airways in August 2013, and the sale of winery Vrsacki Vinogradi to a Chinese consortium in July 2013. An attempt to privatise steel maker Zelezara Smederevo failed in February 2015 after sale talks with U.S.- based steel and industrial group Esmark for an 80% stake failed. The privatisation of Serbia’s large state-owned sector is recognised as a strategic priority for the country. As part of broad economic reforms, the government has adopted an ambitious privatisation programme encompassing more than 500 enterprises and employing a variety of privatisation methods. Special protection from debt enforcement has been granted to 17 enterprises to ensure their successful restructuring in view of privatisation, including pharmaceutical producer Galenika, publisher Politika, trucks producer FAP, agricultural company Poljoprivredna Korporacija Beograd, refinery HIP Petrohemija, non-ferrous metals producer RTB Bor, textiles producer Yumco, tires producer Trayal, bus producer Ikarbus, lubricants producer FAM, coal mine Resavica, cable producer Kablovi Jagodina, and industrial equipment producer Prva Petoletka. To support the reform of state controlled business, the World Bank provided a 100 million euro loan to Serbia in March 2015. Presently, the privatisation deal to have reached the most advanced stage is the sale of Serbia’s crown jewel, Telekom Srbija. The process launched in June 2015 has resulted in the submission of eight non-binding bids. Rumored bidders include Telekom Austria, Deutsche Telekom, MTS, Telekom Slovenje as well as financial investors Advent International, Apollo Global Management, Mid Europa Partners and Colbeck. This is the second attempt at the privatisation of Telekom Srbija after the government turned down the sole binding bid received from Telekom Austria as part of a tender process in 2011 to which financial investors were not admitted. Other state-owned enterprises for which privatization procedures are to start shortly include the Belgrade Airport, insurer Dunav Osiguranje, and glass producer Industrija Stakla Pancevo. Serbia’s largest bank Komercijalna banka, considered a very attractive asset, is also on the privatisation agenda as the government recently appointed a financial advisor for its sale and the process is expected to start by the end of the year. In addition the state plans to put up for sale a minority stake in the national electricity company Elektroprivreda Srbije (EPS). As part of a standby agreement with IMF concluded earlier this year, the government has committed to reorganise EPS, with the spin-off of the power supply and power distribution operations as the first step already completed in July. Following that, a 20% interest in the company must be put up for sale by the end of 2016. The EBRD is considering providing a loan of up to 200 million euro loan to support the company’s restructuring. One of the reasons for the low level of M&As in Serbia so far is that the country has been slow to emerge from the long recession while growth continues to be depressed due to public spending cuts. The beginning of economic recovery is still due as close to zero growth is expected for 2015. At the same time, the signing of a 1.2 billion euro standby agreement with IMF in February 2015 and the government’s accompanying commitment to reforms has sent a strong signal that the country is on the right track and can become attractive for investors in the near future. In the private sector, food and retail are expected to continue to drive M&A, joined by technology and software development which are increasingly attractive. Several privatisation targets hold significant promise and are expected to further boost M&A; however, the sale of the majority of state-owned enterprises included in the government’s privatisation plan present considerable challenge as their financial turnaround may prove unfeasible. Slovenia had fairly stable levels of M&A activity during the 2011-2014 period but signs of acceleration can be seen since the number of deals announced in the first seven months of 2015 is comparable to that for the full 2014. Privatisation and banking sector restructuring are the key drivers of M&A in Slovenia at present, while the private sector is generating an increasing number of smaller deals. Slovenia still has a relatively large state-owned sector, despite the successful recent privatisation of, among other, the second largest Slovenian bank NKBM, Aerodrom Ljubljana, coatings producer Helios Domzale, automotive parts producer Letrika, medical lasers producer Fotona, brewery Pivovarna Lasko, food producer Zito and ski equipment manufacturer Elan. In April 2015 the government proposed a strategy envisaging the privatization of a further 80 enterprises. However, it plans to retain significant influence (25% + 1 of the shares) in 23 of these which are deemed as “important”, including energy company Petrol, gas supplier Geoplin, household appliances maker Gorenje, holding company Sava, steel group SIJ, gaming company Hit, national lottery company Loterija Slovenije, petrochemical company Nafta Lendava and reinsurer Pozavarovalnica Sava. The remaining 57 state-owned interests for which the strategy envisages complete disposal include the Central Securities Clearing Corporation (KDD), poultry company Perutnina Ptuj, footwear manufacturer Peko, dairy Pomurske mlekarne and logistics company Intereuropa. At the same time, the state will retain its interest in certain enterprises defined as “strategic” by the privatisation strategy, including the main electricity players and operators of transports and logistics infrastructure as well as postal operator Posta Slovenije, Pension Fund Management (KAD), insurers Zavarovalnica Triglav and Modra Zavarovalnica, Export and Development Bank (SID), aluminum producer Talum, and pharmaceutical producer Krka. As part of the privatisation processes in progress the Slovenian state has recently received binding bids for Adria Airways Tehnika and hygiene and tissue paper producer Paloma. The planned privatisations include national air carrier Adria Airways and automotive parts producer Cimos (in the second half of 2015), Nova Ljubljanska Banka (in 2017), and the bank resulting from the merger of Abanka Vipa and Banka Celje (in 2019). Indirect privatisation is also under way as Gorenje is selling its interest in several specialized subsidiries, and Pivovarna Lasko is disposing of its interest in beverage producer Radenska and publisher Delo. Notwithstanding the success track record in privatisation so far, the largest potential deal in Slovenia for 2015, the privatisation of Telekom Slovenje, recently failed. Following a formal tender process, in April this year the government received a single binding bid from U.K.- based private equity Cinven. However, after the offer was unfavourably modified in May, the government assessed the bid as unacceptable while the bidder recently announced that it was no longer interested in the deal. Suggested reasons for the limited interest in the tender include legal and regulatory risks faced by the incumbent telco, as well as a valuation gap given other present opportunities for international strategic players. The privatisation authority, Slovenian state asset holding company SDH, announced it will refocus on effective management of Telekom Slovenje’s assets and operations in the near term. It could be expected that a new privatization attempt will be made in due course at after the government reconsiders the terms. In addition to privatisation, a number of companies controlled by one or more banks too are for sale as a result of debt restructuring in the past few years. The fast credit expansion in Slovenia prior to the onset of the global financial crisis in 2008 left many enterprises overleveraged during the ensuing economic recession. The resulting defaults necessitated debt restructuring across the economy whereby lender banks accepted debt to equity swaps and became major equity holders in the Slovenian economy. At present, the banking system is taking measures to restore its stability which include disposal of equity participations. The landmark deal in this category was the sale of 80.75% of food retailer Mercator to Croatian group Agrokor for 261 million euro in 2014. However, the sale of companies controlled by banks is often hindered by their significant indebtedness and the unwillingness of the shareholders to book losses as a result of the disposal. A further effect of the difficulties faced by banks in Slovenia at present are the announced plans of owners to sell Raiffeisen Banka and Gorenjska Banka. These intended disposals add to the M&A pipeline in the country, although the deals have not yet progressed due to apparent lack of investor interest. Although the large deals in Slovenia were mainly due to privatisation, the private sector consistently generated the majority of the deals, albeit of smaller size. Recent private deals include the acquisition of telco Amis by Telekom Austria, acquisition of mobile and fixed services operator Debitel telekomunikacije by Telekom Slovenje, acquisition of mobile operator Tusmobil by Telemach, acquisition of wood panel producer LIP Bohinj by Hasslacher, and acquisition of metals and plastics processor Iskra ISD by KJK Capital Oy. Key sectors for private deals have been telecommunications and manufacturing. Due in part to the very limited ability of local banks to offer acquisition finance at present, private M&A activity in Slovenia is primarily driven by international and regional investors. Given the significant equity investments of local banks in Slovenian enterprises, disposals by the private banking sector are expected to be the main driver of M&A activity in the country in the short term. The strengthening of the country’s financial infrastructure following the restructuring of the Slovenian banking sector is hoped to improve the investment climate in general and boost the interest of international investors. Together with the resumed economic growth registered in 2014 and the positive macroeconomic outlook, this will benefit private M&A activity which is already providing a solid baseline level of deals across many sectors. At the same time, pending privatisations are likely to contribute key deals in terms of deal size. The data is sourced from specialized databases and publicly available reports. A deal is defined as transaction involving transfer of ownership in a going concern where a majority or significant interest is acquired. The timing of inclusion is based on announcement of (i) signing of sale and purchase agreements for private deals and (ii) formal offers for public companies. Private deals which were not closed following signing have been excluded.